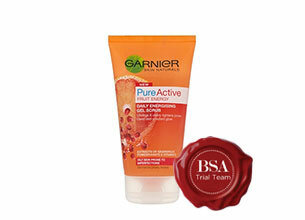 Enriched with Grape water and Vitamin E, the formula cleans and purifies skin effectively. The creamy formula with micro-particles gently exfoliates skin for a deep, pore cleansing action without drying your skin. I have recently purchased and started using this product. I have combination skin, and i found it to be a nice light product which is leaving me feeling more satisfied with my facial routine. Give it a try. This is the best product I have ever used, it removes all the dead cells on my skin, leaving my skin so fresh and smooth. I must say the Garnier Fresh Radiance Boosting Scrub smells great. This product smells amazing. I really love applying it in the mornings, it definitely gives my skin a bit of a boost and it works really well with my oily skin. The texture is unique but in a good way. I really do recommend this to those who are looking for something new and fresh. This product smells incredibly fresh and the gel foams easily to a rich lather with microbeads that slough away dirt and oil. You are left with clean pure feeling skin. My cheek area felt a little tight and therefore I think this product is better suited to oily and combination types.